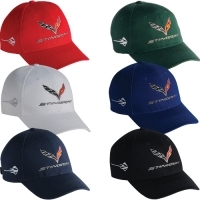 C7 CORVETTE STINGRAY CAP- STINGRAY CAP EMBROIDERED WITH THE CORVETTE STINGRAY EMBLEM. 100% COTTON, CHINO TWILL, STRUCTURED, MIDPROFILE, VELCRO CLOSURE. MADE IN THE USA.